Two and a half years ago Hubby and I moved to Virginia and put our Florida home on a weekly rental program. This meant the beach home needed to be fully furnished, including dishes, flatware, small appliances ect. We moved with only four pieces of furniture, my beloved transferware and a few boxes of home accessories. Now we own two homes full of furniture and accessories and an antique booth filled to the brim. As I look around our Virginia home I wonder how in the world did I accumulate so much stuff in such a short period of time and why did I buy all this to start with? Now, don’t get me wrong, I have always loved decorating and changing out accessories. I have never been a minimalist where our home is concerned but I also never had the accumlation of things I do now. I truly believe blogging has contributed to my obsession. Do I really need six sets of dishes to create a pretty table scape? it was only $4.00 or it was such a deal? How many demijohns does one person need? just waiting for my next project? As we begin the process of selling our home I am donating things back to the original thrift stores where I purchased them. Some things have been taken to my booth and everything marked 50% off for a quicker sale. I have sold several pieces of furniture on Craigslist so far and we plan to have a garage sale once the house is under contract. Other things have been packed away. Each time I pack something I ask myself do I love this and do I really need it. If not it goes in one of the other piles. The funny thing is once I started to de-clutter I began to really like the way our home looked. Do you buy things at garage sales or thrift stores just because they are a deal and do you ever feel overwhelmed with so much stuff? Love the pictures of your dining room and the way the sunshine streams in. So pretty. And, the tablescape as well. Wish I could shop at your store or attend your garage sale! We vacation in Florida every year. We always try to find a cute weekly rental on the west coast between St. Petes and Indian Rocks. We are in the count down mode to this yrs vacation so when I saw your post it got me excited and anxious that our house needs a good cleaning and decluttering before we are off. Are you moving back to Florida? I own two homes also, one a weekend home so you know I am guilty!! i feel like i am constantly in decluttering mode, mainly because i am constantly bringing in clutter! i know the feeling! you will feel so good when you have much less to move with you. Sherry, you have so wonderful collects ~ Beautiful photos. I hear you on how fast things accumulate. We have our belongings from our last home in storage while we construct the farm house. Well I have just about everything I need to furnish this farmhouse now amongst the building supplies… what am I going to do with the storage stuff??? I had a problem posting before but I was saying that each year we have a garage sale to clear out the clutter and next thing I know, we have just as much stuff all over again. Argh! One step forward, two steps back! Two years ago this May, I packed up with the intentions that we would be selling our house within the next few months. Half that stuff is still packed up Sherry and I don't even miss it. I did wind up bringing some things out of boxes, but I also gave stuff away, donated stuff and even did a yard sale with my sister. I definitely have less stuff out now then I did before I packed it up, but it really makes me think about what I bring into the house now. You certainly do have some beautiful pieces! If I lived closer..could easily take them off your hands:) I am a serial collector myself! I have way too many dishes, silverware, serving pieces, silver trays,etc…but when I use them I fall in love all over again! I see you have red and white castles china by Johnson Brothers..I have it in blue and white and love it! Enjoy your gorgeous things and may they find a happy home in your new place! Sherry I must say lots of what you said is me,me,me!! The extra dishes, and 'things' to make a vignette, etc. Now I'm clutter central. Seems I am better at buying and finding bargains then putting them away. This year is my time to organize and declutter. It will take me awhile I know. Not that I don't still shop but I am trying really harder to make sure I LOVE it before it comes home with me. If you want to send any of those demi johns my way, I would be happy to pay shipping!! I have moved so many times that I really don't have excess stuff. After several moves, I just got tired of packing, so I try to reign myself in when I see pretty things that are whispering my name. I am guilty to all of the above! I agree, I think that blogging just might have an influence on how I purchase stuff. Also, having a booth keeps me on the lookout to buy things for resale and some of it ends up in my house! I've been thinking about weeding out myself, maybe this is the inspiration I need. For every piece of furniture that I bring into my home two others have to leave! That's my new rule! Thank goodness for Craigslist! I am much happier with fewer items to clean! Oh, we are a work in progress, aren't we? Best of luck with your mission, I know you can do it :)…Just keep thinking of all the amazing antique malls you will get to visit here in FL…I would be more than happy to personally give you a tour of a few of my favorites in my area ;)…which is only going to be about 2 or 3 hrs drive north of you. Do I feel overwhelmed with so much stuff? Naaaahhhh! Are you kidding. I will show my bonus room before I clean it up and maybe some other places where I have stuff crammed! You can send me your extra demijohns though! I literally was just one the phone telling my friend how I've been taking at least one bag/box of "stuff" to the Salvation Army each week since before the holidays. Still no end in sight, and since I go drop stuff in the back and then go around to the front of the SA or GW and buy more I don't see any progress being made. Your treasures are beautiful and I sure wish I lived in the Virginia area. We decluttered and donated 7 years ago when we built our present home. I have adopted a less is more sort of idea here and have begun "decluttering" again. But then I still add to the collection. Especially the dishes!! I loved these photos, Sherry. Gorgeous gorgeous gorgeous!! P.S. Your vignettes are always so inspiring to me so I am grateful for your lack of minimalism! I've had difficulty commeting on your post – in fact I've had to go away, think, and come back again. My profile starts with the words "I am a 'collector' and I discover there is no cure!" I too am wondering if I'm worse since I started blogging ? I have started to 'clear out' and began with the loft a few weeks ago. You simply cannot imagine how much 'stuff' was up there after 33 years in the same home! It still needs more 'tweeking', but at least I've made a huge start. I now ensure I donate at least one item (and often more) each time I visit the charity shop, and in turn am not buying unless I REALLY LOVE the item – so often leave with nothing. I'm really trying to be more conscious of what I buy and bring into the house. I've decluttered a lot, so I want to keep it that way. Maintenance is a lot of work in itself, I don't want to backslide! I SO enjoyed this post. Five years ago when I moved into Buttermilk Cottage, I seriously downsized. Although I've acquired some new things, the size of my house now prohibts me from getting new things unless I'm TOTALLY in love with them. Since beginning to blog I do find myself wanting to get things I really don't need just because they'd add to a post. I totally agree that blogging and accummulating go hand in hand. At least you've had your antique booth to justify some of it. All your blogger friends are feeling very regretful that they don't live near you. You could have the grandest yard sale in history! Your dining room is unbelievably pretty. I love those green bottles. Can I just ask what part of Virginia you live in, cause I want to go to your yard sale!! I am near Charlottesville, I'm willing to drive!! I love those demi jons, they are so awesome!! I do know what you mean though, every time I go to the thrift store I see things that could be made over to be so cute, but I don't buy them, at least sometimes I don't. Seriously though, I would love to go to your yard sale when the time comes! You've many beautiful things. What I'd give for a dining room with walls of windows and beautiful sunlight streaming in. When we made this last move here I got rid of quite a few things. We are in a smaller home so I had to. But since I started blogging it's starting to creep back in. I had to stop and realize this isn't what I wanted and I could not simply buy stuff to blog about anymore. So, I'm trying to cut back and hope to open an Etsy to sell some of my treasures. If it goes well then that will be my outlet for my shopping. First I must test the waters with what I have. I do love the thrill of the hunt! Hi Sherry! Oh, yes ma'am, I'm totally guilty too! If I lived close by I'm sure I'd be glad to take a few things off your tiny hands! Sherry~ I will be moving to Florida.. so I will be more than happy to take any excess off of you! What a lovely home you have… and beautiful settings…. We have moved 3 times in 10 years because of health reasons…downsizing each time. BUT…we have an antique business and have had for years with yearly English buying trips. So my goal is to get the warehouse inventoried & online this year before we buy anything else (except those incredible things we just can't pass up because we enjoy antiquing) but hope to at least make progress. It is a never ending process. But if you love the hunt, the looking, the visualizing….it's something my husband and I love to do together, so…We are enjoying it while we can! Oh do I ever Sherry! Sometimes I want to get rid of everything and just go back to the bare bones. Your decorating style is so lovely, and I loved seeing more of your gorgeous home. You really do have beautiful collections my friend. Hi Sherry, one year ago this May I pack my home in Miami and move to California,Half that stuff still packed ,I bring some things out of boxes, but I also buy more new stuff hire in California Im moving back to Miami whith more stuff this May. Yes You and me have the same problem now. I wish you a good luck. I'm with Susan above- my home is too small to add much else (and believe you me that's the only thing keeping me from being a borderline hoarder). I don't even go by the "love it" rule: if i can't think of a specific place to display or store it, it doesn't come home. When we first moved here though, i was bent on filling it up with stuff and bought a ton of stuff (at least half of which is in storage boxes! Good thing it was all thrifted). I found the best way to break my thrifting habits was to write down all the money i spent on nonessentials (aka not groceries or cat litter, etc). Eek! I used the same technique to drop my fast food habit. Nothing puts me in check more than seeing my (very scarce) money go down the drain on stuff i don't need. I used to think, "He with the most toys wins." Since I am in my 60's, I realize I am a caretaker of things and I don't want to do that anymore. after the holidays has been the best time for me to rethink my decor and excess. i have purged through alot and i still have a way to go. some will/is being sold on CL, some donated or repurposed. i had to keep myself away from the thrift stores…i was buying but not using the stuff as i had intended. so, until i get this purging done, nothing is coming back in unless i can use it immediately! and i'm with you, i'm really liking the less is more approach. Your home is just gorgeous…I'd love to shop there anytime lol !! I understand this so much! When you are a dealer, you need to buy for resale…but I am getting more selective! I am de-cluttering my house, too, everything feels cleaner and I can really see what's special! Great post! Your blog is my favorite and although you may feel you have lots of stuff, you seem to use it so creatively. I'd love to snag some things from you! I'll have to check out your space at West End this week-end…what is your dealer code/where is your booth? Parting with any ironstone?? Or do you have some wire baskets? Glad you'll be closer to family! If you need a hand with and estate sale/yardsale let me know! I'm nearby and willing to lend a hand! I enjoy seeing your pretty dishes Sherry. Isn't it funny how things can accumulate? I really don't buy anything for the blog and have gotten into the habit of only buying what I truly love. Our house is small and it forces me to be disciplined I guess. Your vignettes are always so pretty. It is so hard to resist accumulating beautiful things, esp when you enjoy creating vignettes and sharing them with others! I love everything i see in your photos, but i do sympathize with the need to discard…i call it 'zenning' my house whenever i do it… and i also redonate things to the thrift shops where i got them! Yes, of course! I went to Home Goods and World Market today and bought a bunch of junk I don't need but absolutely love and HAD to have. I love all your "stuff". I'm getting better at passing things by, but still have a lot of work to do. I find it so much easier to walk away from the big stuff and if I can't resist, something else in my house has to go. I'd be in big trouble if I had more room. Oh Sherry, I know EXACTLY what you are saying! I have spent the last year forcing myself (or should I say challenging myself) to upcycle and only use what I have or reuse. It really reached a point that I was buying things I just didn't need and had no place to put them. Most of my blogging content is now based around upcycling or forcing myself to make what I really want. Good luck with the purge, you will be so much happier! At least your clutter is cute!!!! Seriously! I love everything you have! Sherry, I did not know you were here just 2 1/2 years ago! That is a pretty quick turn around! I am really a minimalist. I don't buy anything unless I need it and if I bring something in I take something out to my antiques booth. I had the new decluttered shabby chic way before it was popular, not alot of chotchkies here! Normally I'm in full yard sale/estate sale mode this time of year. I am hardly interested anymore. I have enough stuff already! Well, your things are really beautiful. I love all the windows around your dining table. I'm pretty good at not buying things just because they are a bargain. I think…is it worth having it in my life from now on? But I do think blogging contributes to compiling stuff. Like right now…I'm thinking I need some new Easter things because everyone saw my Easter stuff last year already. I do feel blogging makes me feel like I need to constantly change it up. Personally, I don't think 6 sets of china is too much. A girl needs different sets for different times of year and different types of parties. I have 5 different sets myself….at least…and I don't even ever entertain. But I do like having options. Sherry, do you know that I blog stalk you? I do! 🙂 I go back over and over and study your vignettes and actually stood in front of a table this week and thought "now what would Sherry put here?" I'm not kidding! You have such a knack for putting things together in a way that looks elegant and yet not fussy or contrived. Thank you so much for linking this up to Inspiration Friday! Your dining room table and all the goodies on it are wonderful. I love the whole room. You have such beautiful things whether you need them or not!!! I do the same thing. And I move a lot so I always sell off or give away things upon departure. I've come to the conclusion, decorating is my hobby. If it's something I enjoy doing and it's not breaking the bank, then why not? I don't buy things just b/c they are a deal though. I have to love it. Sometimes I pine for the stuff I get rid of. But too much of a good thing is too much when you're packing up. Besides, the best part is the hunt. i comPLETEly agree, blogging has absolutely contributed to me buying more "stuff" and definitely to thrift store shopping. i had never shopped there before, but now i purposefully look for new ones! I love LOVE your style and your blog! I too have too much stuff and like to move it around. 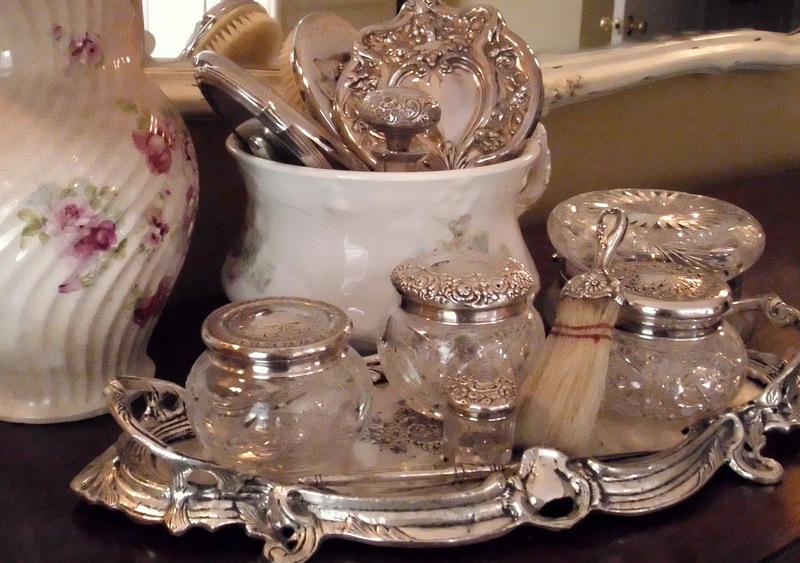 I love demijohns and collect a lot of the same things I see in your luscious photo vignettes. So glad I found your link tonight. Oh Sherry, I hear you loud and clear.I am trying to say No more often than Not and clear out some items myself.Best of Luck! 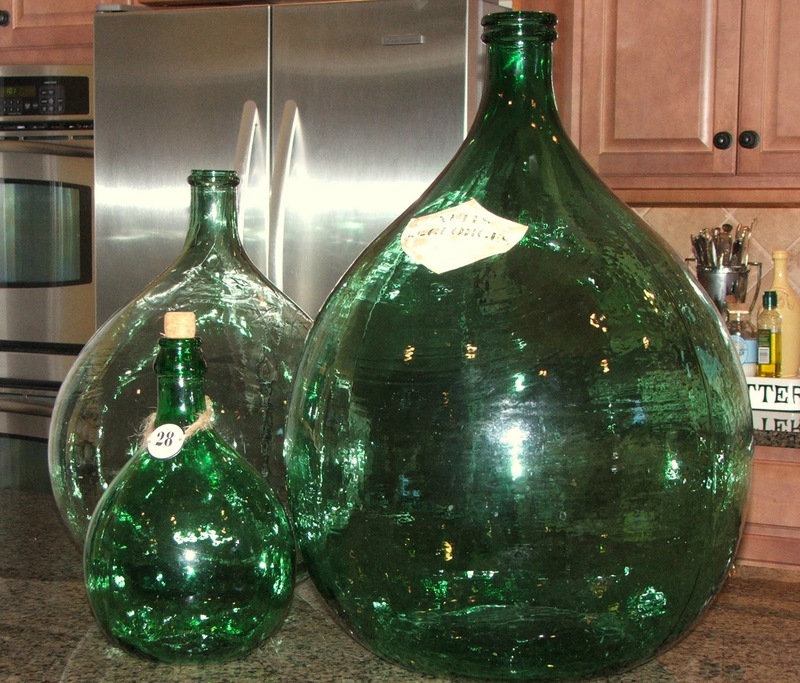 Though if you are selling those green jugs/bottles I would be happy to buy those from you.Love them! Let me know? My husband wishes I paid more attention to the "cost". Although, when I get a bargain you can bet it is the firt thing I point out. 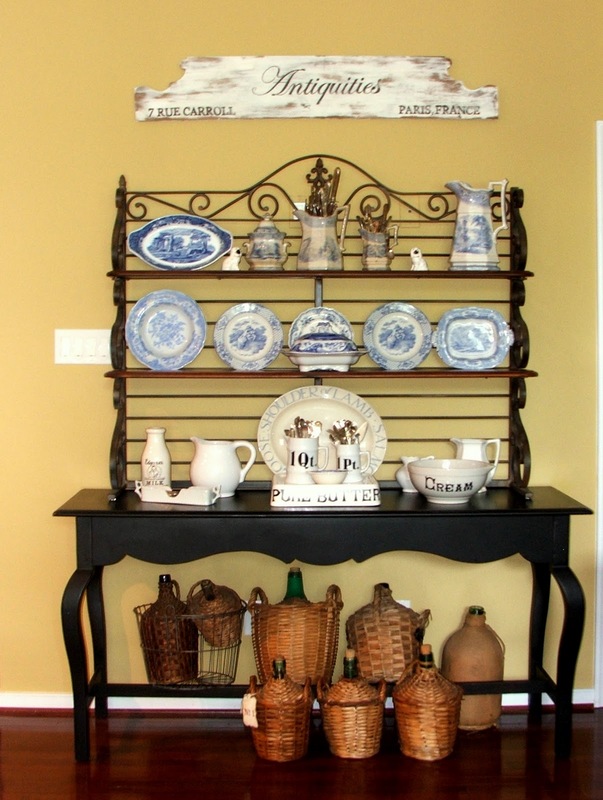 but how great would it be if you stored it away, labeled, organized and just kept out your ironstone or whatever you choose…. just in time for spring I say!! HI Sherry, I think you wouldn't realize it unless you were moving. That happened to me when we had to sell our summer house in NH, all of a sudden so many things, just a huge overload. Most of it went to the Salvation Army! I felt better just getting rid of it, even though much of it I thought was good stuff. Oh well..it will serve you better when you move not to have it all follow along. Just bring your favs with you and treat yourself to some new things for your new home. You are speaking to the choir. I did a huge clean-up when we moved into this house. We've only been here a year and periodically, I just walk through and edit. I wish my clients could do that. they seem to want to hang on to every little thing whether it adds anything or not. Your home is lovely.. you know how to put everything together and make it work so well. Such a clean look. Love your fall table scape – I have the same table linens and <3 them! It all turns out beautifully – just enjoy it! I had to read some of your post to my husband, especially the wood cluttering the garage. Everything is a future project. I feel your pain. Sometimes I think I'll scale down….but where's the fun in that? Sherry…could I ask you a couple questions. The first really silly one but important to me is..I noticed that you have a similar bench seat in your dining room as I do. How do you keep pillows on it without them slipping down and laying flat? See silly. Secondly, what is the pattern of your white dishes? Hi Valerie, I don't see a way to contact you so hopefully you'll come back here for the answer. The dishes were bought at Penneys several years ago and they are from Chris Madden's collection. The cushions don't always stand up on this bench but they cooperated until I got the photo.